This image is circulating on the web. 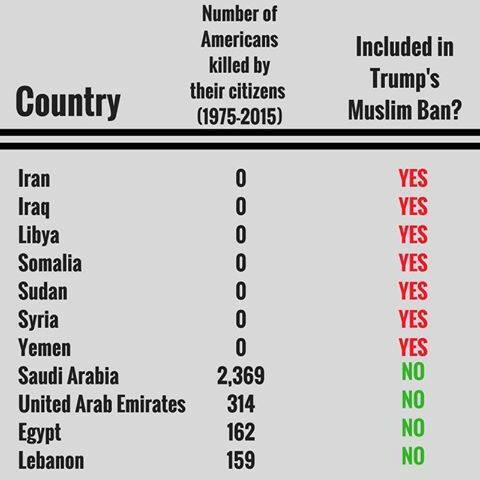 Is its figures for deaths on American soil at the hands of citizens of banned versus non-banned countries correct? Here's why Trump's Muslim ban makes literally NO sense: it bans people from countries whose citizens have never attacked the United States. Note that the claim is about deaths on American soil, although that is not explicit in the image. Notes: I'm not interested in the precision of the figures - errors of a few tens of people are not important. Also note this is not a duplicate of this question, since this is specifically about terrorist deaths, not any terrorist activities. EDIT: I did omit originally the specification that the statement was about deaths on American soil. The data seems to have come from a publication of the Cato Institute titled "Terrorism and Immigration: A Risk Analysis". The paper's appendix includes "Table A.1. Identified Foreign Persons Who Attempted or Committed Terrorism on U.S. Soil, 1975-2015", which seems to be the source of the claim. The table does not list country of origin, which makes verifying the claim somewhat time consuming. However, startling fact is that the 9/11 attacks make up the vast majority of foreign-born terrorist murders in the United States for that period. 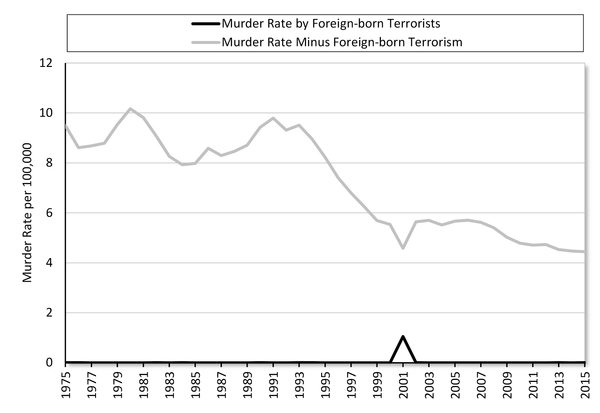 Since there were 17 pre-9/11 murders and 24 post-9/11 foreign-born terrorist murders in the time period, that means the numbers in the chart are correct within the tens of people specified by the question. Whether or not the Cato Institute information is wrong, outdated or misleading, I haven't considered in this answer. 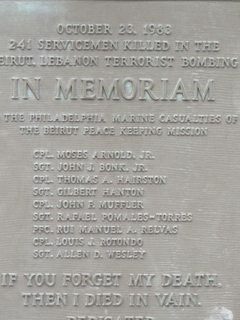 Iranian citizen Ismail Ascari, killed 241 Americans, 23 October 1983.